The smell of the bulk aisle in a grocery store immediately takes me back to the 1970s, when my mom took us to the “hippie grocery store.” It had that funny smell (no doubt patchouli) and barrels and barrels of grains, pasta and beans. I especially remember her toting those string grocery bags, which she used long before it was cool to do so, and wondering how she would carry anything in them without having it fall out of all those holes. 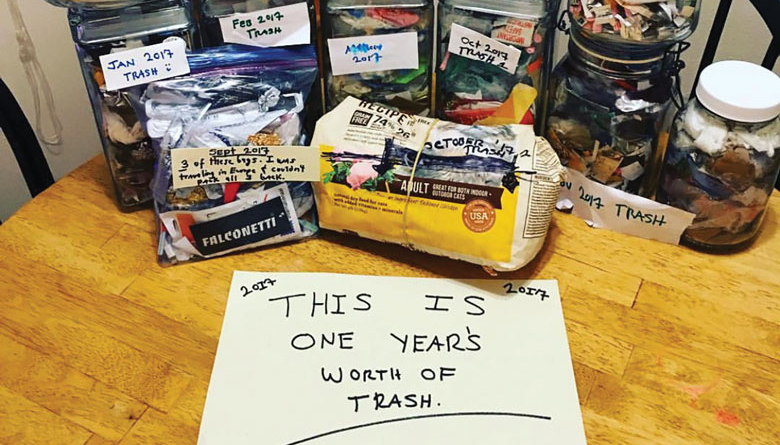 My mom is the OG queen of zero waste, currently a white-hot hashtag movement. She made water bottles for hikes out of old Joy soap bottles (seriously)—and fashioned cross-body bottle holsters from old socks and strings of fabric. She would refinish lunch boxes with paper doll decals coated with some sort of shellac finish (so very Martha Stewart before Martha was Martha). And don’t get me started on those long sandwich-bread plastic bags she made us use as waterproof boot liners that caused our feet to slip out when our moon boots got stuck in a snowbank. She is 84 and has been doing this regularly for as long I can remember, and in this era of straw shaming, she’s ahead of her time. Leave it to the good people of Seattle to find the eco silver lining in this uber trash-conscious era. Those hippie stores are now thriving retail outlets like PCC Community Markets or chic minimalistic neighborhood boutiques like Public Goods and Services in West Seattle, where you can bring in your well-designed containers and fill them up with earth-friendly cleaning supplies. Curbside chats with my neighbor Deb Seymour about her commitment to uber green living, while rolling in our garbage and recycling bins (she’s been known to fit a month’s worth, or more, of trash in a canning jar), inspired the story on zero waste living in this issue. Though I won’t be fitting my family’s garbage into a jar anytime in this century, we’ve at least downsized to the 32-gallon container. I bring my canvas bags on my grocery runs and have even bought some bee’s-wax-coated pieces of fabric at a farmers’ market in Bend, Oregon, this summer to replace my Saran wrap whenever I can. I am starting to look at my empty dish-soap bottles in a whole new way (fair warning, kids). But what I wanted to know, as a skeptical, overtaxed working mom, is: Doesn’t one need the luxury of time and money to live completely zero waste? Read Maria Dolan’s report on and then tell us how you’re chipping away at the tangle of trash. Elsewhere: News of Paul Allen’s death broke the week we went to press with this issue. Ever since we began publishing our annual list of Most Influential People each November, it’s been nearly impossible not to cover Paul every year. He was forever contributing something to our city—museums, neighborhoods, scientific advancements, sports teams—and I’m still mad at this city for not voting to approve his Seattle Commons plan in the early ’90s. But one moment with him will always stick with me: When we photographed him for Seattle’s cover, the year he opened the Allen Institute for Brain Science and bought the Seahawks, it was clear he wasn’t comfortable having his photo taken. But when I complimented him on the gorgeous turquoise ring he wore, he lit up and then explained that it had been his father’s ring. I didn’t know him personally, but thinking about this billionaire always wearing something so personal and sentimental made me admire him all the more.